The NWU participated in the People’s Climate March, together with the United Auto Workers, in September, 2014. The National Writers Union is a local union of the United Auto Workers. The UAW is one of the nation’s most diverse unions, representing workers in manufacturing, health care, higher education, gaming, public service and other sectors. It is truly a union of all workers, uniting people from different occupations, employers and industrial sectors. We all work together for a common purpose: to win social and economic justice for all working families, at home and abroad. What you may not know is that UAW membership is far more diverse than can be described in any single list of categories. 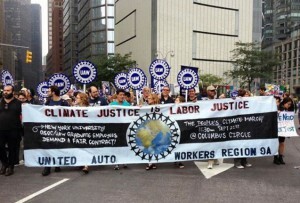 The NWU is active in the UAW Community Action Program (UAW CAP). Read more here about NWU’s participation in the UAW Region 9 and 9A NYS Lobby and Legislative Conference in Albany, NY, in March, 2015. Through the UAW, NWU members help promote labor’s strong efforts to improve everyone’s quality of life. UAW members are active in lobbying Congress, state legislatures and local governments on issues that matter to working families. Also, the UAW affiliation enables the NWU to aggressively pursue our members’ grievance cases — continuing the fight for workers that started in the 1920s and has since grown international.